I make these for my son who became a vegan so Reece's are out for him. Mine never come out looking very good, but the boy does not mind at all! Wow, I must make this now! JM, you cannot be for real. You just can't. You are one phenomenal woman, like that Maya Angelou poem. Seriously. That's you. Now you've done it. You made me sprain my salivary glands. This is what heaven must taste like. mmmmm...I didn't even know I could make my own! Yummy! Thanks for sharing your recipe. I'm going to try this recipe. I tried to make someone...and the PB was way too runny. OK, you just spoke to my heart. I love me some peanut butter cups like little else in this world. Those look amazing, must have them! 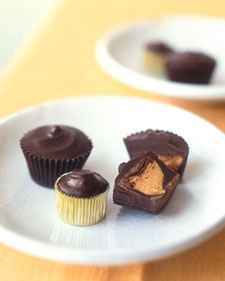 peanut butter and chocolate are made for each other! OK, Jenny...you're going to force me to make these, aren't you? I'ma gonna hold you accountable...just so you know! OMG I DIDN'T KNOW YOU COULD MAKE THOSE THINGS SO EASY!!! I am so doing this. Thank you. I think. I tried to resist checking these out but my reader was screaming at me...MMmmmm..so delish looking Thank You very much...and easy too..! Mmm, sounds SO good! And not too terribly hard to make, although I'm sure I'd find a way to mess it up! Yes, yes, yes... I do love peanut butter and chocolate, but thank God I am being too lazy tonight to make these because I have no doubt I'd eat every last one. I have got to try these! Chocolate and Peanut Butter is one of my favourite combinations. Thanks for sharing this, my waistline hates you but my tastebuds adore you! I'm going to have to try these. I remember back in the '70's having an American Exchange Student in school and she handed out Reese's Peanut Butter Cups. I thought they were fantastic. We have them distributed here in Australia now and they are not as good as I remember. Will definitely give your home-made version a go. This post makes me suspicious that you are trying to kill me.....oh the triglycerides....oh the clogged arteries.....oh the yumminess..
good GRIEF these sound delish!! Oh holy god. I want these right now. But I don't want to make them because I'll screw them up. Bring me some? Please? Peanut butter and chocolate. There's really no better food combination. O.K., yum! Thanks for sharing! Definitely going to try these out! in the interim......check out Bella Cuccina's whole line of chocolate bars sprinkled with sea salt. OMG, fresh ginger, dark organic chocolate, sprinkled with sea salt???!!! What are they trying to do to me? I am premenstrual for goodness sake! Only available in the retail store on N. Highland, but well worth the trip! I'm afraid to make these because I just might eat them all! It's a good thing I don't live by you...I'd be knocking down your door for the delicious yummies you come up with constantly. In a non-stalkerish way of course. HA! I'm going to try these - peanut butter is my hubby's favorite thing in the world.